Eco-Schools in Northern Ireland have been looking at the issue of food waste as part of their Eco-School action plans. Pupils have been hearing about the damage caused to the environment when food waste is sent to landfill and have also been shocked to hear that globally we throw 1/3 of our food away. Most households in Northern Ireland have recently been supplied with a food waste bin service by their local council which is collected and then made into compost. Pupils have been asked to highlight the great resource produced from recycling food into compost. They have learnt about the 3R’s of Reducing, Reusing and Recycling food waste and have been showing the creative ways they recycle by posting pictures to social media of their superhero waste recycling moves #wastehero. The project supplied schools with the resources to conduct a food waste school survey and also supplied pupils with stickers and pledges to take home to remind the whole family about food waste reduction and recycling. A before and after survey will be conducted to see if pupils feel more confident about recycling their food waste after taking part in the project. 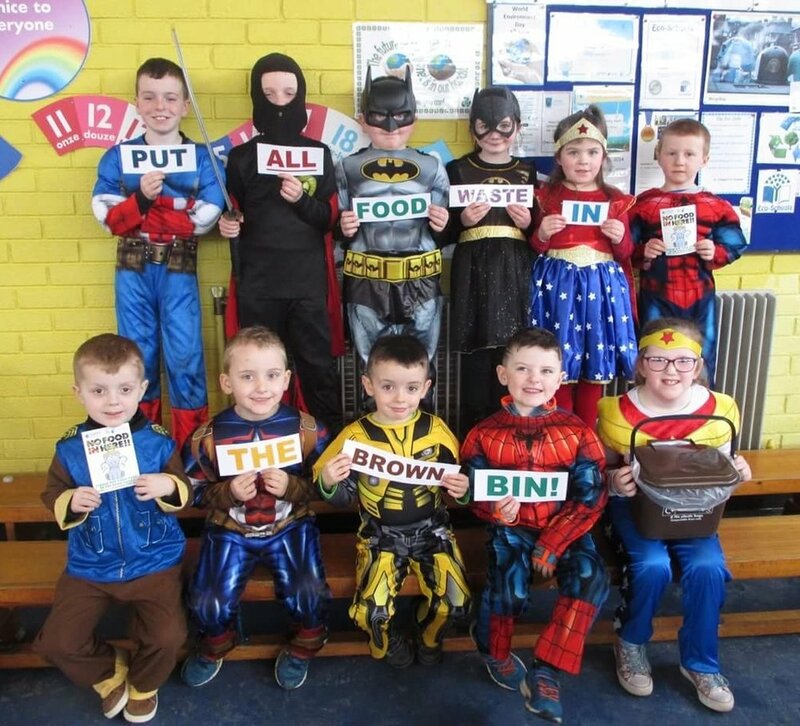 Pupils from St Joseph’s Primary School, Cookstown, prove they are Food Waste Superheroes.